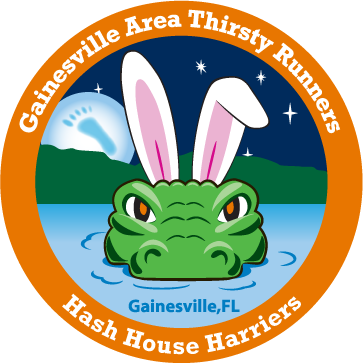 Gainesville Area Thirsty Runners. This is a drinking club with a running problem! Attend at own risk. It’s like an athletic happy hour. Attendance may result in injuries, hangovers, getting arrested, pregnancy, and even marriage. This club is for mature adults only. Expect live, semi-live and dead hares, with 2-5 mile, relatively easy trails. We cater to all levels of hashing (walking, jogging and running). Expect medium length circles with numerous beer down downs (bottled water also available)! However, we are a “no touch” hash. Nobody will make you do anything you don’t want to do. Its all voluntary. So, if you have half a mind, come out and join us on our next trail.